When it comes to decorating cakes and cupcakes, I don’t like to rely on fondant all the time. I adore using chocolate in my cake designs. Even though the chocolate pieces are fragile, I think they make cakes look very appealing with very little effort. 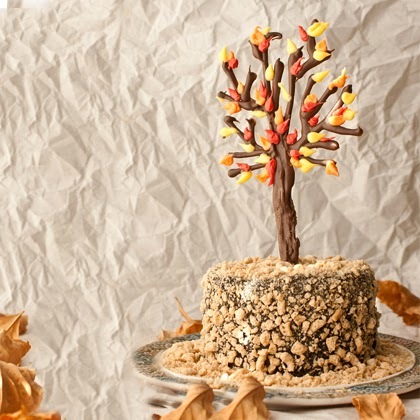 Today, I will show you how to make a Fall- themed chocolate tree. I used it as a topper for a mini cake. You can make a smaller version and use it on top of cupcakes. Melted dark chocolate, Melted orange chocolate, Melted yellow chocolate, Melted red chocolate, Piping bags or squeeze bottles, Lollipop sticks, Wax paper, White paper, Tape, Pen.